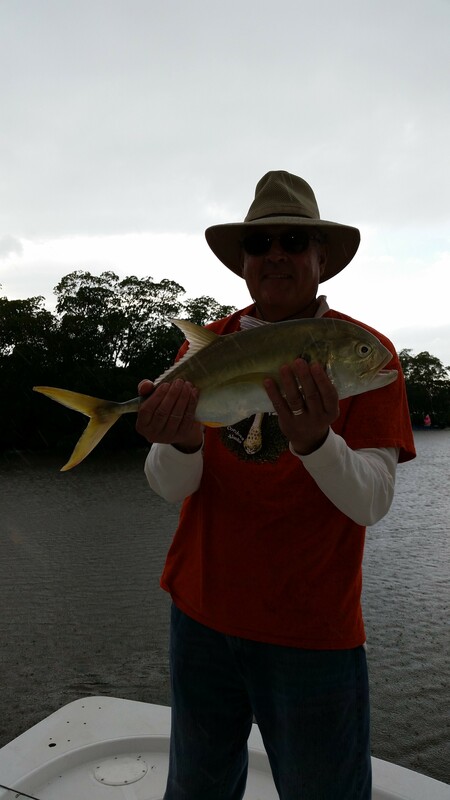 Fishing this week in Estero Bay and Fort Myers has been productive with the return of decent tides in the middle of the days. Snook, have been around, along with alot of Jacks. We are still experiencing the highest tides in the middle of the night but this is pretty typical for the time of year. If it is warm enough and you can time the tides right with the moon it can be a decent opportunity for night fishing for Snook. Typically the warmer months are better but you can still do it in the winter. The nice thing about night fishing this time of year is there is more than just snook in the lights, anglers can also find a decent amount of Trout mixed in. Pilchards are still the go to bait for me and most captains in our area, however when we are getting cold days the shrimp has been doing better. Focus on all the normal winter time spots for fish, and remember they tend to move further back in to the bays when it is cold and winter is here. So wherever you decide to fish remember that tip. I have been doing well around mangrove shorelines and oyster beds far back in the back country so far. If possible remember to get alot of bait in the mornings, this will allow you to “chum” with live bait. Grab a net full of pilchards squeeze them to incapacitate them and stuff them in a cut off wiffle ball bat to sling them in to the spot your fishing. If snook fishing look for a pop or swirl on top of the water than throw your bait right at where it boiled. This can save you alot of time and effort on a spot since you will know fairly quickly if they are there or not. Look for the next week to be just as good as this week, so get out on the water and catch some fish!